Welcome to FloydFest 19~Wild! We love you, and we can’t wait to see you again. Their mission is to be the best music festival experience of their time; to sell a limited quantity of tickets to the highest-quality event experience, bar none, celebrating music, art and life in an intimate, visually stunning environment. BESTIVAL, an all-day street festival taking place at Waterline Brewery on Saturday, May 11 and Mushpa + Mensa will be there! Every year for over 30 years, encore’s annual readers choice awards, the official and longest-running Best Of Wilmington, has been an ongoing celebration of local culture, including recognition of businesses, eateries, bars, goods, services, people, media, arts, and entertainment. In 2019 we will be turning our annual celebration of winners into an all-day arts and craft, food truck and beer festival at Waterline Brewing, underneath the Cape Fear Bridge, along Surry Street. And it’s all to benefit DREAMS Center for Arts Education! Here’s the low-down…. Free to attend, though we welcome a suggested $5 donation. Folks who donate ahead of time via below link will be entered into a drawing to win a $50 #encoreDEALS credit! On the docket: CheeseSmith Food Truck, Bill’s Food Brew, T’Geaux Boys and Donut Bus will accept cash (and credit) for purchases. Travis Shallow and Bob Russell, Randy McQuay II, Striking Copper, Rebekah Todd Music, and David Dixon will play throughout the day on one of two stages near the beer garden. Laughter galore will come from our hosts, Pineapple-Shaped Lamps, on the main stage outdoors, and The Cape Fear Comedy Festival comedians will take the stage inside the brewery throughout the day! Local arts and crafts vendors will be lined up along Surry Street, selling their fun, handmade wares. So come prepared to buy awesome goods. Winners will go to awards booth to find out if they won and then mosey to the step and repeat to have their picture taken. (But anyone can step in and flash a smile or two!) All pictures will appear in encore through June in our Best Of coverage! For more than thirty years, PeakFest has brought families together for a day of fun, food and fellowship. The event, which is referred to as an arts and crafts festival, has deep roots within the Apex community. What started as a small community day in a school parking lot has grown into an event that draws hundreds of vendors and over 22,000 people to the streets of downtown Apex. Every year, the Apex Festival Commission plans a bigger and more exciting day. PeakFest is the largest public event in Apex and, it is about more than fun. Live music all day, artist of every kind (jewelry, pottery, watercolor and acrylic), entertainment for the kids, food that you would find at the fair, and so much more! Vendors are charged a fee to participate and businesses become sponsors, helping to offset the expenses of the day. Mushpa + Mensa will be there! Live & Local Spring Fest is produced by Artsplosure in partnership with Live It Up! Hillsborough Street. This spring celebration is your chance to join your community in celebrating the unique art, music, food and beer of North Carolina. Come out to Hillsborough Street on April 14th for an afternoon of performances on the Main Stage, a Kid’s Zone with performances and craft activities for the youngest members of our community, as well as a food truck rodeo and craft beers from our friends at Raleigh Brewing. Mushpa + Mensa see you there! 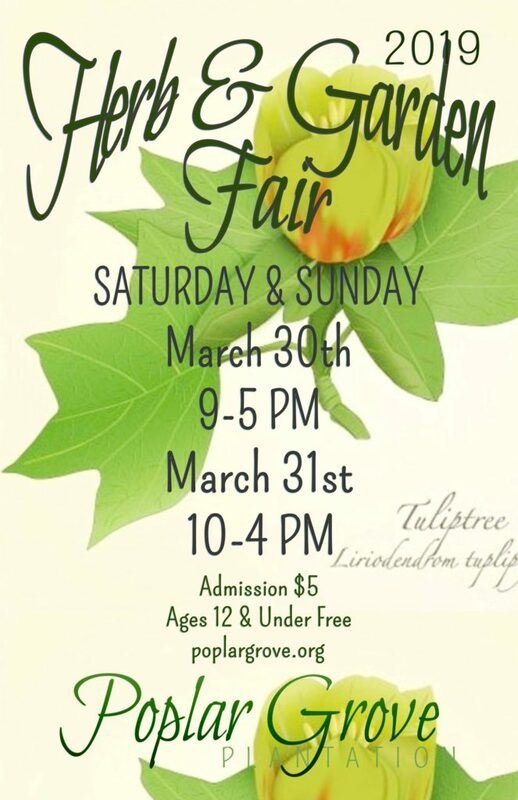 The grounds of Poplar Grove will be filled with a wonderful selection of locally grown plants of all types – herbs, perennials, annuals, hanging baskets, shrubs, native plants, vegetable starts and houseplants, plus garden art & accessories, herbal & all-natural products, artisan crafts & local foods. View the 2019 Herb & Garden Vendor List! There is a $5.00 admission fee; kids 12 & under are free. Included in your admission price is live music by artist and musician, Mark Herbert from Broccoli Brother Circus and Stained Glass Canoe featuring Andrea Templon. There will be Kid’s Activities for the little ones, and free classes & nature trail walks (come see what is in bloom!) for young and young-at-heart throughout the two-day event. Learn from your neighbors and some of the community’s best local historians, herbalists, and basket-makers! Our State magazine will be on site to distribute their special April issue. There will be Greek food samplings, wraps, seafood, hamburgers, hotdogs, smoothies, and baked goods available for purchase. For the kids, The Stables at Poplar Grove will be open for tours (closed toes shoes required) from 10 am until 2 pm. The entrance fee is $5.00 a person (young and old) as well as animal Meet & Greets on the back lawn. Self-guided house tours will be offered at a discounted rate of $7.00, though you are welcome to sit on our porches and visit our Gift Shop and Slavery Exhibit on the lower level of the Manor House for free. The blacksmith shop will also be fired up, so be sure to follow the billowing smoke & peek inside. Welcome to FloydFest 18~Wild! We love you, and we can’t wait to see you again. The Wild Goose Festival is an art, music, and story-driven transformational experience grounded in faith-inspired social justice. We all live by stories, whether we realize it or not…our personal stories of things we’ve done, or that were done to us, corners we turned, chances we took, mistakes we made. We also live by the stories that permeate our culture, framing stories like big glass windows – we see the world through them, but sometimes barely even know they are there. At Wild Goose, we’ve always been about making space for courageous, imaginative, and participative social justice work, unleashed creative expression, disruptive spiritual practice, as well as astonishing and inspiring music and art. WHERE IS THE WILD GOOSE FESTIVAL? The festival will be held in Hot Springs, NC. Hot Springs, near Asheville, is nestled in the mountains of Western North Carolina and along the banks of the beautiful French Broad River. It serves as an intersection along the historic Appalachian Trail and is part of the Southern Appalachian Mountains. Located across the road from the Hot Springs Resort & Spa is the Hot Springs Campground, where Wild Goose Festival will be held in 2016. The site features ample sites for tent camping, as well as full RV hookups. On site comfort stations feature showers and clean bathrooms. Numerous rental cabins/cottages are also available in the town, many within walking distance of the campground. Come be brave and beautiful with Mushpa + Mensa. Proceeds from the festival benefit the church and local charities. This year St. Nicholas Greek Festival are partnering with Good Shepherd Center and a portion of the proceeds will be donated to them.